OneOS will soon cease to exist. The new framework I'm developing, Silica, will replace Bedrock and once that's done an OS based on it will be made. See info here. I am not longer working on this! A year to the day after the release of version 1 and two years to the day since I joined the forums, I present to you OneOS version 2! At this stage it's quite a early beta really, but it's (probably) working better than the previous version was. There are lots of bugs, missing things and the like, but no matter how minor they appear please reply with details. I will put more details about what's new here soon, but the main this is that the majority of the OS (especially the core) has been rewritten. One of the biggest goals with version two was to increase performance. Now, it's not really at a point I'd consider 'ideal', but it's better than 1.3. I've spent hours upon hours trying every conceivable thing and it's certainly better, but I simply think CC can't handle any more (but I might be wrong). I also wanted it to obviously be easy to use. I think it's improved over version 1.3 a bit, although it was already very easy, so making any huge leap here was basically impossible. I wanted it bug free. Now, at this point that's not at all realistic. Lots of things are missing and buggy, but eventually it will. Pocket computer support was another commonly requested feature. Now, it's still not perfect, but the new switcher (which I think you'll love) is much more pocket friendly. These will be fixed before the proper version 2 is released. Can't paste in Shell (just realised why, wasn't handling paste event). 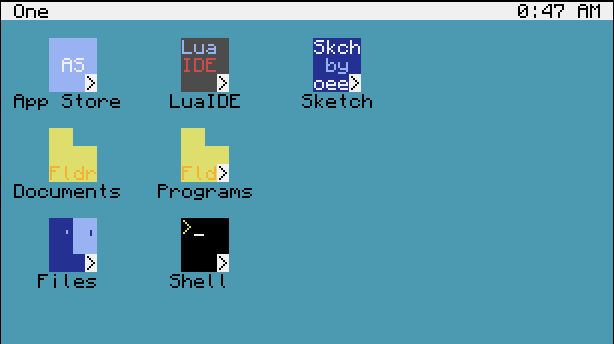 I'm actually making a completely custom shell program though. Back/Forward buttons don't work in Files. Clipboard doesn't work in Ink. Desktop icon dragging is a bit glitchy. Program opening animation is laggy. Search on Desktop is disabled. The App Store site suddenly just died on me. I think it might be CloudFlare's fault, but I'll see. This: http://i.imgur.com/wQ5Zdt6.png I think it's 1.65 only, but I'll check. Installing on 1.64 can also fail, this is due to a 1.64 bug. Try a few times, or if you can upgrade to 1.65. It allows you to do things such as change the tool bar colour and access the global file system. Today is a year since I joined the forums. To celebrate I've decided to release my latest project, OneOS. So, anyway, enough history. I present you the 21 27 (thanks to Bedrock only 19 now) thousand plus line monstrosity that is OneOS. As you've hopefully picked up, this isn't another basic login screen OS. I started working on this in November and have worked on it fairly constantly since then. Note: At the moment OneOS does not run correctly on ComputerCraft 1.6, I will not be fixing any 1.6 related issues until it is properly released. If the above does not work replace run with 'get' and add 'installer' to the end, then type 'installer' in to the shell. The main desktop. The icons are drag-able. 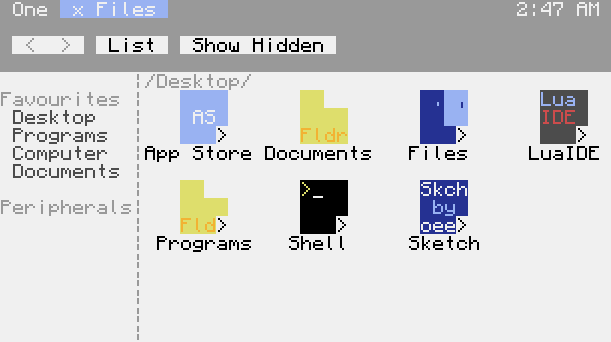 You can also drag files in to folders. The file browser. If you have any connected peripherals they will appear on the sidebar. Sketch, my Photoshop inspired editor. It supports layers, transparency, clipboard, resizing etc. If you so wish, for whatever reason, you can also use the shell. The About Page, notice the Storage Usage information. 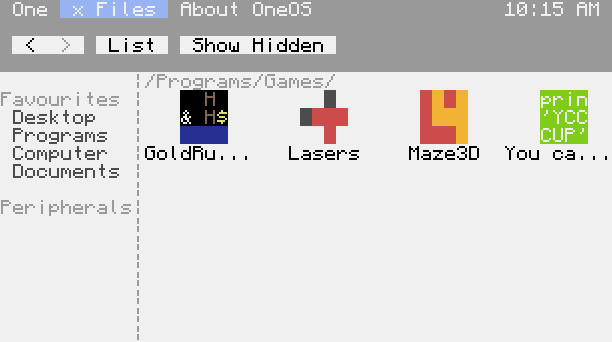 The collection of games bundled with OneOS. I'm getting a 'Domain not permitted' error! This occurs because you are using ComputerCraft 1.6.3 However, there is an easy fix, read this post. Why aren't you using windows? A few reasons, screen real estate is very minimal in CC, windows make that even worse. Many programs don't redraw when the screen size changes and they tend to be rather annoying to use. I'm quite happy with the tab based system in OneOS. Let me know below, if it think it's a good idea and won't be too hard to add I might add it. I've found a bug/I've got a suggestion! Please to the GitHub issues page and make an issue there. Avoid posting an issue that is already listed. I'll add more here when people start asking more questions. + Indexing system, all file changes cause updates. This allows for some cool, low-performance impact things such as Search and file types. + Added monitor support! Open the monitor in Files to use it. + Added system logging (see /System/OneOS.log). This will help huge amounts to hunt down and fix bugs. + I've tried really hard to reduce the file size of the OS. I've managed to get it about 450KB which I'm pretty happy with. However, this has meant that some programs (Ink, Sketch, LuaIDE, Door Lock & App Store) have all been minified. They still have line numbers for error tracking, but they're not much good for learning from. Use the public versions in those cases. This is quick update to fix issues a few users had with wireless modems on older versions of ComputerCraft. This fixes all of the user submitted bugs so far (I don't think I've missed any). A tiny bug fix, mainly the default computer name. The first public release of OneOS! Sketch had a blindingly obvious bug that prevent it from working. Bug fixes from GravityScore and Kingdaro. As I mentioned earlier, OneOS is bundled with the ComputerCraft App Store. I will be making a forums post about it in the next few days. If you'd like to submit an program, head to ccappstore.com. It will be released as a standalone program soon too. 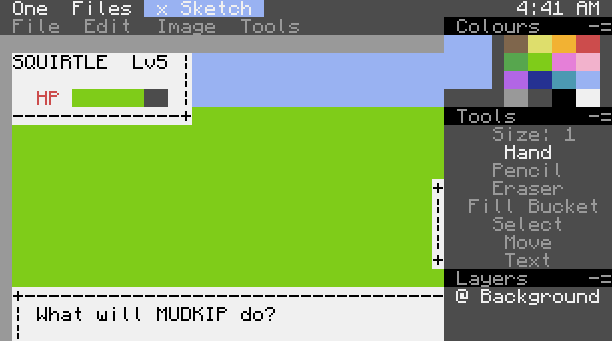 I'll also be releasing Sketch, my image editor, soon too. I recommend you check it out. Despite weeks of testing there's bound to be problems, if you find anything that isn't right just let me know. - You fork OneOS on GitHub and put all files on there. - You get my consent (via PM) before releasing it on the fourms. OneOS is under the Creative Commons Attribution-NonCommercial-NoDerivatives 4.0 International (CC BY-NC-ND 4.0) license. Non-Commercial - You may not use the material for commercial purposes. If you would like to publicly release anything derived from OneOS please let me know via PM on the ComputerCraft forums. Copyright and Similar Rights means copyright and/or similar rights closely related to copyright including, without limitation, performance, broadcast, sound recording, and Sui Generis Database Rights, without regard to how the rights are labeled or categorized. For purposes of this Public License, the rights specified in Section 2( />(1)-(2) are not Copyright and Similar Rights. Offer from the Licensor ??? Licensed Material. Every recipient of the Licensed Material automatically receives an offer from the Licensor to exercise the Licensed Rights under the terms and conditions of this Public License. Section 3 ??? License Conditions. Section 4 ??? Sui Generis Database Rights. Section 5 ??? Disclaimer of Warranties and Limitation of Liability. Section 6 ??? Term and Termination. For the avoidance of doubt, this Section 6( /> does not affect any right the Licensor may have to seek remedies for Your violations of this Public License. Section 7 ??? Other Terms and Conditions. Creative Commons is not a party to its public licenses. Notwithstanding, Creative Commons may elect to apply one of its public licenses to material it publishes and in those instances will be considered the ???Licensor.??? Except for the limited purpose of indicating that material is shared under a Creative Commons public license or as otherwise permitted by the Creative Commons policies published at creativecommons.org/policies, Creative Commons does not authorize the use of the trademark ?? ?Creative Commons??? or any other trademark or logo of Creative Commons without its prior written consent including, without limitation, in connection with any unauthorized modifications to any of its public licenses or any other arrangements, understandings, or agreements concerning use of licensed material. For the avoidance of doubt, this paragraph does not form part of the public licenses. Edited by oeed, 11 July 2015 - 12:40 PM. Edited by GravityScore, 28 February 2014 - 08:35 AM. This is great! Not only does it work well, but it has a great interface as well! - When I first tried installing this, it was 97% done or so, then it errored with something like "expected string got number compared number awa3812-948!!!?!?!??'". When I went to the line that errored, it was the function that checks if the computer has enough memory, and it was on the line where it was comparing fs.getMemory or whatever. Sorry that I can't give you that line now. 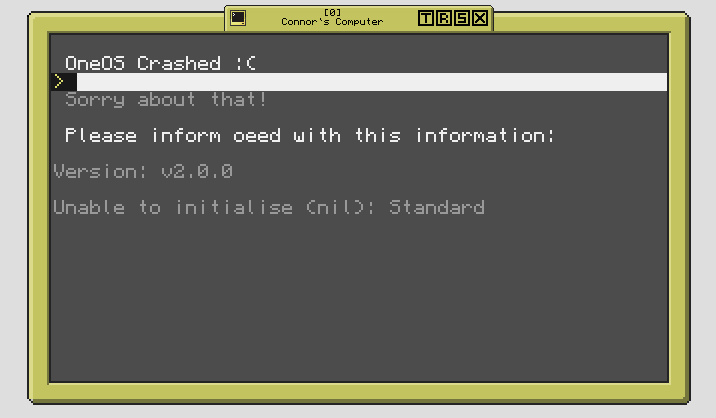 - Whenever I try to open the file system (Programs, Files, Documents), it pulls up with a grey screen (not the crash screen) saying, "Peripheral.lua:4: attempt to call nil" The program has finished. Click anywhere to close this program." - At one point, the clock in the upper right stopped working, and would only update when I clicked one of the programs on the desktop. Edited by Jiloacom, 28 February 2014 - 10:46 PM. To add to that the cursor doesn't go back to it's original positon and stays blinking by the clock. 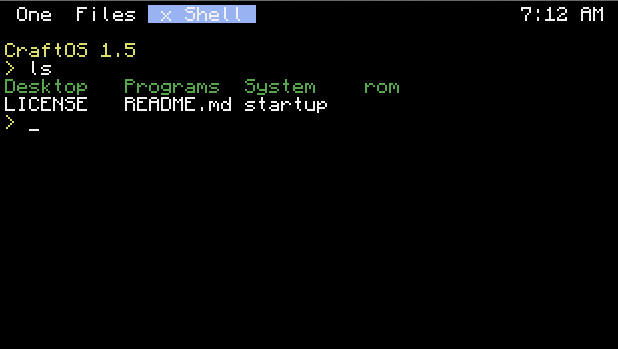 Also, after shell commands fill all the screen and shell scrolls down sometimes it doesn't show the bottom line. Ok, thanks. I'll look in to. The Shell app has caused me some grief in the past due to the nature of how the programs work. Also, I'm going to start writing a documentation for the OneOS API for use in programs. It'll be on GitHub soon. Anyway, that's the only bug I could find. I love the interface and functionality of OneOS. Dialogs start to flicker when you click or drag. The Settings app needs some serious fixing. It crashed my (in-game) computer beyond recovery. Sometimes, when running apps from the App Store, the OneOS tool bar is drawn twice (on the first and second row). This was the case with "PokeCC teaser trailer", which may be the cause as it is a really bugged program anyway. I believe this is a case of "Ghosting", which was supposed to be solved according to GitHub. The App Store's exit button doesn't work. When clicking "Update OneOS" from the One menu, there is no way to tell OneOS is checking for updates, then suddenly a dialog pops up. Maybe add a dialog so that the user can see that? Wow, that sounded really vague. what I mean is that when you try to update, there is no way to see what is happening (is OneOS checking for updates or is it just crashing?). Don't get me wrong, I really think OneOS is impressive, but I think these things should really be fixed. In Sketch, when I try to add a layer to an NFT file, it tells me that "NFT do not support layers!". Is this intentional/grammatically correct? I don't know, it doesn't seem natural to me. When I tried to exit, the Cancel and Quit buttons (on the "unsaved changes" dialog) did not do anything. Clicking the 'x' in the tool bar again exited the program immediately. Edited by InputUsername, 01 March 2014 - 12:08 PM. Ah, well, in terms of the computer name bug, it should've asked you to enter a name... if I'd deleted my settings file. Essentially, there's setup program there, but it's not being run. I'll try to fix those issues though. Edited by oeed, 01 March 2014 - 11:48 AM. You are Superior,Can you Add My Game (CCRedirection)? 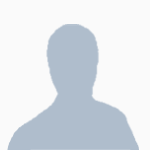 Edited by RamiLego4Game, 01 March 2014 - 12:09 PM. My biggest Problem is, that the "Shell"-App isnt very good working/looking. Would be nice if it looks&works like the normal CraftOS Shell. The CC Appstore page is rather buggy when editing text icon layers in Chrome 33. No, it's not too negative, it's useful! I've got quite a few school assignments due in the next few days so I haven't had a ton of time for bug fixes, when I've got some free time I'll try to fix all of these. I've got a feeling that the reason the dialogues flicker is because when you click somewhere that isn't the dialogue they flash (to get the users attention). I thought I'd fixed the ghosting issue but it appears to have come back, it may have been reverted or theres something else causing it. I'll take a look at it. The main problem with adding more games is that if the OS gets to big it might run out of space while updating, there are ways I could try to fix this though. Add it to the App Store for now. I'm not sure about why the App Store wasn't working, what country are you in? The website's been up 100% of the time so far. I might look in to adding an ability to default to global APIs if the bundle version doesn't exist, however. Yea, it was a lot worse, trust me. The main problem I've found is the text colour changing to white sometimes. I'll try to fix it. Edited by oeed, 01 March 2014 - 10:02 PM. Glad to finally see this have been released, Loved to test it before and I'm sure you've fixed the "bugs" I found, or have you?